The range shown here includes mesh relief sculptures for hanging and and freestanding pieces, all available to order. Nikki Taylor makes each wire mesh sculpture freehand, modelling the mesh in the air, based on live models and photographs. There is no moulding round a solid master, so each piece is a unique sculpture. I discovered wire mesh in my search to escape the solidity of conventional sculpture materials. For me it perfectly reflects the duality of our bodies – the ability to express the intangible self through physical form. The diaphanous nature of the mesh, allowing free passage of light and elements through the sculptures, represents the connectivity and interaction between our selves, others and the surrounding ether which exists on so many levels. Finally, wire mesh allows me to work direct with the material giving a particular spontaneity and freedom to the making process. Single torso relief figures such as the ‘Free’ or ‘’Rhythm’ series can be ordered in a choice of 2 sizes - medium measuring approx. 66 cms h x 49 cms w x 17 cms d or large measuring approx. 90 cms h x 52 cms w x 21 cms d. ‘Flight’ and ‘Adonis’ are life –size, for other pieces please enquire for sizes. These wire mesh relief sculptures are designed with invisible fixings to hang either against the wall, or from above. Exciting shadow effects can be created by positioning lighting to shine through them, projecting the image of the sculpture onto the wall. Nikki also specialises in commissioned body portraits in wire mesh. 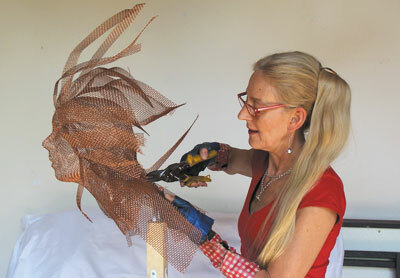 Nikki normally uses mild steel mesh for indoor sculptures. For outdoors she prefers stainless steel with various industrial coatings for a weatherproof finish and has also used copper. Please contact her for more details, to order a sculpture or to explore any commission ideas.